The High Atlas mountains are one of the most exotic ski touring destinations and an experience that will not leave you indifferent. Toubkal, the highest peak of North Africa at 4167 m is surrounded by high mountains forming a barrier, 80 km south of Marrakech. This situation, as well as the altitude and the collection of valleys allows a constant snow cover during the winter. During the ski tour, we will stay in huts or cottages, and each step will bring us to the discovery of a new valley, and unusual and beautiful landscapes. We will also be accompanied by a local team: guide, cook, porters and mules to carry our equipment when we have to walk on the valley floor. Arrival at Marrakech airport, transfer to hotel, dinner and overnight. After breakfast, transfer by minibus to the village of Agersioual, the starting point of your hike, meet the team, you cross the pass that bears the name of this village to join the Imnane valley, a slight rise take you to the village of Tachdirte night at the refuge CAF or cottage, dinner and overnight. After a good breakfast in front of the Aksoual and Likemt, you towards the top of the Iguenouane (3900m) a good climb and also vouchers are worth more to feast off track to rejoin Tachdirte, dinner and overnight cottage or refuge. Another climb to the Likemt, then descent on Assarou and continuation of the village of Aremd, dinner and overnight in a cottage (1900m). Climbing Mount Toubkal (4167m) the highest peak in North Africa, and descent to the refuge, very good tracks to better treat yourself with a beautiful view. 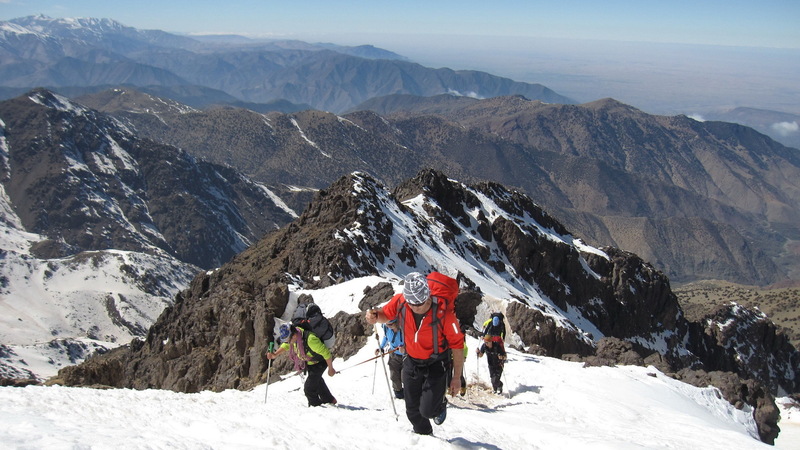 Day dedicated to the ascent of Mont Ounoukrim and green descent Imlil, lunch and transfer back to Marrakech, transfer to hotel, dinner and overnight. Airport transfer assistance to check out.